The first thing we're changing is this damn dirty traffic! The quintessential thinking man’s science-fiction flick, Planet of the Apes was a popcorn actioner born out of the 1960s counterculture movement that deftly and provocatively spoke to the issues of racism, class, sexism and humanity’s stewardship over the earth. Four sequels and one 2001 remake later, Rise of the Planet of the Apes pays dutiful homage to the 1968 original, from a smattering of Charlton Heston’s memorable lines (e.g., “Take your stinking paws off me, you damn dirty ape!”) to a TV news clip showing the launch of the Icarus manned Mars expedition, the rocket that would ultimately land Heston’s Colonel Taylor on a simian-dominated world. Yet, the real inspirations behind British filmmaker Rupert Wyatt’s capable revival reside elsewhere. Will Rodman (James Franco) is a San Francisco-based research scientist whose experimentation on apes during his development of a cure for Alzheimer’s and other brain-related maladies goes awry. Forced to put down his lab primates, Will rescues a newborn chimp that Will’s own dementia-suffering, Shakespeare-quoting father (John Lithgow) names “Caesar.” Will also soon discovers that Caesar inherited the neural stimulation triggered by a serum Will tested on Caesar’s late mother. The early stages of Rise of the Planet of the Apes closely resemble the true story of Nim Chimpsky, recently told in James Marsh’s superb documentary Project Nim. In both, enterprising academics raise a chimpanzee from infancy in a strictly human setting. Like Nim, Caesar displays a grasp of communication, notably sign language, and an affinity for his human handlers until its innate ape instincts make him volatile and dangerous. Both are eventually abandoned and consigned to cruel animal shelters. 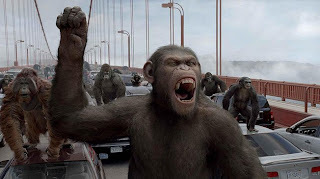 The remainder of the film actually reboots 1972’s Conquest of the Planet of the Apes, in which a super-intelligent chimp – also named Caesar – leads his ape brethren to rise up against their human oppressors. Rise of the Planet of the Apes updates for contemporary concerns over bioethics and the possible perilous consequences of genetic experimentation (replacing the original’s rebuke of atomic irresponsibility), which here spawn both smart apes and man’s eventual demise – a closing credits kicker recalls the manner a deadly virus spread worldwide in 12 Monkeys, ironically. Wyatt maintains a methodical pace that actually inures the story’s realism and heightens the disquieting tension. He also benefits from the biggest quantum leap in the cinematic depiction of primates since 2001: A Space Odyssey, using performance capture technology headlined by a surprisingly emotive rendering of Caesar by Andy Serkis (previously the model for such digital avatars as Gollum in Lord of the Rings and Peter Jackson’s King Kong). One of Caesar’s slow-burn stares evokes more apprehension than an entire Roland Emmerich apocalyptic extravaganza. Moreover, Wyatt wisely does not overreach. This is a story about the genesis of the simian uprising, not one that ends with images of apes rampaging through the White House or toppling a certain landmark in New York Harbor. Even an effects-filled, climactic clash with police along the Golden Gate Bridge is geared more towards introducing the acumen that Caesar and his followers will use some day to overthrow and supplant humankind atop the animal kingdom. The film has its flaws, including wasted supporting characters like Will’s veterinarian girlfriend (Freida Pinto) and a sadistic zookeeper played by Brian Cox. It also too easily lets Will off the proverbial ethical hook in favor of his greedy big pharma boss (David Oyelowo). Still, Rise of the Planet of the Apes is a worthy, well-crafted successor to its namesake. And, unlike most of its big-budget summer counterparts, at least it stimulates your brain cells instead of killing them.